I introduced you to some of my favourite “normal” Chinese food in an earlier post. Apparently I made friends around the world hungry and homesick – hopefully in a good way! Here is another installment of some of the yummy dishes available in most restaurants – with much love to my ex-China friends all over the world. Again, I am linking to photo-filled recipe pages in Chinese. 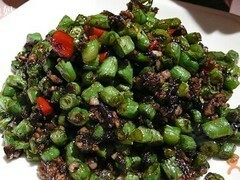 Literally: “olive vegetable green beans,” this is my favourite green bean dish. While the spicy Sichuan green bean dish 干扁豆角 [gàn biǎn dòu jiǎo] is more common, I’m not a big fan of its strong Sichuan pepper flavour; I prefer the simple savoury of “olive beans”. The 橄榄菜 [gǎn lǎn cài] or “olive vegetable” is a pickled vegetable mixture sold in jars and so named because olives are used in the pickling recipe. “Olive beans” are sometimes made with fresh chili, sometimes with no chili. Sometimes the dish has pork mince, sometimes it is just vegetables. If you are a vegetarian, check that it is made with no meat when ordering (they can just not put the meat in, at least in theory). See a Chinese recipe here. Literally “pine nuts corn” – which is almost the whole story. This dish is mostly a pile of corn kernels with pine nuts, plus a little finely diced carrot and maybe some finely diced green vegetable (like peas, cucumber, or perhaps green peppers). The flavour is lightly sweet, not savoury as I had assumed when I first saw it. It is clean and refreshing, which makes for a great contrast if the table is full of the oil/chili heavy dishes common in Beijing. See a Chinese recipe here. This is another simple dish – which is part of what I like about it. Even the name is simple! It literally means “sauce fried diced chicken”. It isn’t as oily or spicy as many Beijing-style meat dishes. It is just a tossed combination of diced chicken breast, cucumber and (usually) carrot. It has a simple, salty-sweet sauce (not too strongly one or the other) that I find delicious. See? Simple. Which makes it great homey cooking in my book. See a Chinese recipe here. 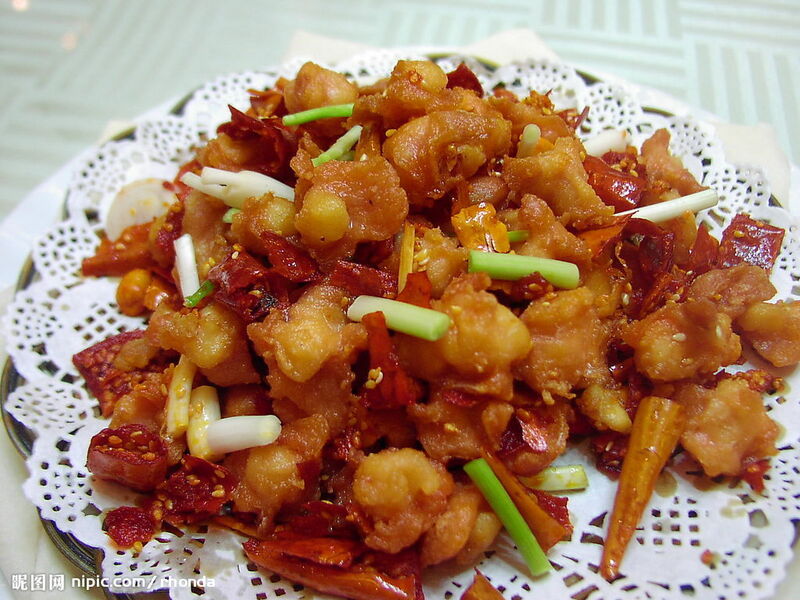 Literally “spicy chicken,” this dish looks very intimidating when it arrives on the table! Often it seems to be a big pile of dry chilis with just a bit of chicken peeking out here and there. Sometimes there’s some digging required to fish out all the chickeny goodness! La zi ji isn’t as spicy as you’d think. Dry chilis have less potency than fresh, and kept whole the seeds (the spiciest part) don’t get in your mouth, which means lots of chili flavour without as much heat as you’d expect. My favourite part of la zi ji is the coating – the chicken pieces are dusted with flour then fried cripsy. Now for the tricky part – there are two ways to make this dish; the other way is stir fried, not shallow fried (so the chicken isn’t crispy), and uses fresh capsicum and/or chili, not dried. It’s a very different dish in flavour and texture – but uses the same name. See a Chinese recipe here. On my first trip to China, my teacher insisted that I try Shanghai style xiao long bao – and I have been a BIG fan ever since. When a small eatery opened up near me in Beijing serving very good Shanghai xiao long bao I was thrilled! These small, steamed dumplings filled with pork (and sometimes prawn) are known as “soup dumplings” because as they cook, liquid seeps out of the mixture forming a soup inside the dumpling. It’s really quite clever. A fatty soup stock is chilled until it forms an almost solid state that can be cut into small cubes, which are then mixed with the filling when the dumplings are made. As the dumplings steam, the warmed stock re-liquifiies and fills each dumpling with warm, soupy goodnes. They are served with a dish of soy sauce and fresh ginger slices, and the overall flavour is clean with a hint of sesame oil. I usually bite a small hole in the top to let the steam out (and blow air in) before popping one in my mouth; I have burned my tongue on numerous occasions because I find it so hard to be patient when I have fresh, steaming xiao long bao in front of me! See a Chinese recipe here. I don’t think I’ve ever heard of that top one. Loving the recipe links. The day I found out I was pregnant again, I spent two hours pinning old chinese food favorites. Cruel to be pregnant with no access to serious Chinese food cravings!